Rachel Canty is working on her Master’s research at the University of NC Institute of Marine Sciences. 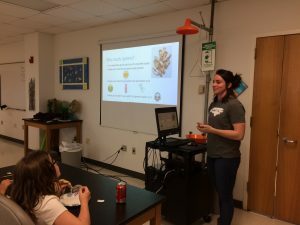 She joined us and talked to the teens at Coastal Teen Science Café about her work with the bacterial pathogen V. vulnificus, which often infects humans through the consumption of raw oysters. The bacteria, V. vulnificus, resides in warmer temperatures, usually in the summer months when oysters are not in season. A good rule of thumb on the oyster season is they are only in season during months containing an “r.” The Big Idea from this Café was to discourage teens from consuming raw oysters out of season. The teens in attendance were mostly coastal seafood lovers, so this Café was very important for their health. 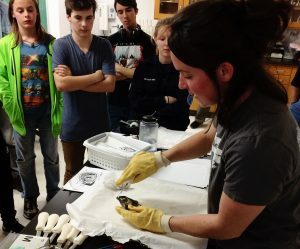 Rachel explains how to dissect an oyster to teens. For an icebreaker, Rachel handed out small sheets of paper with drawn oysters on them. Most of them were just a regular drawing of an oyster, but a few of them (3 or 4) were green and one or two oysters were red. After she started the presentation, she explained the significance of the colors. 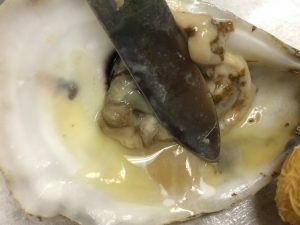 The green oyster meant the audience member ate an oyster and was infected by the bacteria resulting in food poisoning (vomiting, diarrhea, etc). The red oyster meant an audience member was infected and killed by the bacteria. This activity was to show the statistical significance of V. vulnificus. She went on to explain most people do not die from being infected. Death only results in consumers who already have detrimental health problems. 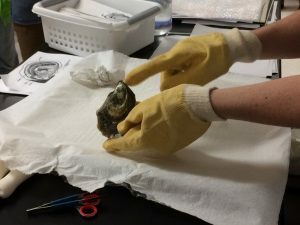 Most of the conversation between the scientist and the teens was during the oyster dissection. They were very interested in the life cycle and anatomical features of the oysters. One group of students even found a small worm in their oyster which sparked a conversation about symbiotic relationships and parasites. Most students are used to dissecting frogs, pigs, or worms but not simpler organisms such as marine invertebrates. There were a few misconceptions about oysters including how much pain they feel and if they had sensory organs such as eyes and ears. The coolest part of this Café was how multifaceted it was. While this Café had mainly a biological component, Rachel brought an environmental spin to it by addressing V. vulnificus showing up in Alaskan waters due to climate change. This session also had a huge health and seafood industry component, highlighting local interests and careers. 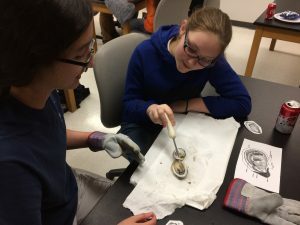 For the hands-on activity, Rachel demonstrated an oyster dissection, which included opening an oyster in front of a group of teens while explaining certain anatomical features of the marine invertebrate. She explained that the easiest way to open an oyster was to find the hinge, stick the oyster shucker into the hinge, and cut through the muscle used by the oyster to open and close. Following the demonstration, students were given a diagram of oyster anatomy and were paired into groups to dissect an oyster on their own.